In 1991 Winco entered into a new phase of service “Awning maintenance”. 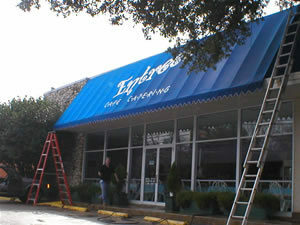 Awnings are more challenging than the exterior of 40 story buildings that we clean. Why? Awnings are porous and as a result absorb pollutants deep into their surface. When we first began we used silicone based sealants (which is primarily still the industry standard), which attracts dirt and transports them deep within the vinyl. This promotes more cleanings for the customer, but this is not what we wanted. Winco began using “ Ultra Gloss” which is a clear one-year acrylic top coat which has proven to keep the awnings cleaner as well as keep the plasticizers from leaching out. Therefore dramatically improving longevity. Winco uses only non-butal alkaline cleaners to clean with. The wrong cleaning agents will absolutely accelerate aging and promote fading. It is critical that your awning is cleaned properly, because it is very easy to remove the compounds that keep it from deteriorating. This is why Winco uses only the best awning cleaners. A well maintained awning gives you a generous return on your advertising dollars by promoting curb appeal. Let Winco awning maintenance help you achieve your desired results. If you have any questions or would like additional information, please contact John Wallace-Bradley our Awning Maintenance/Projects Manager.